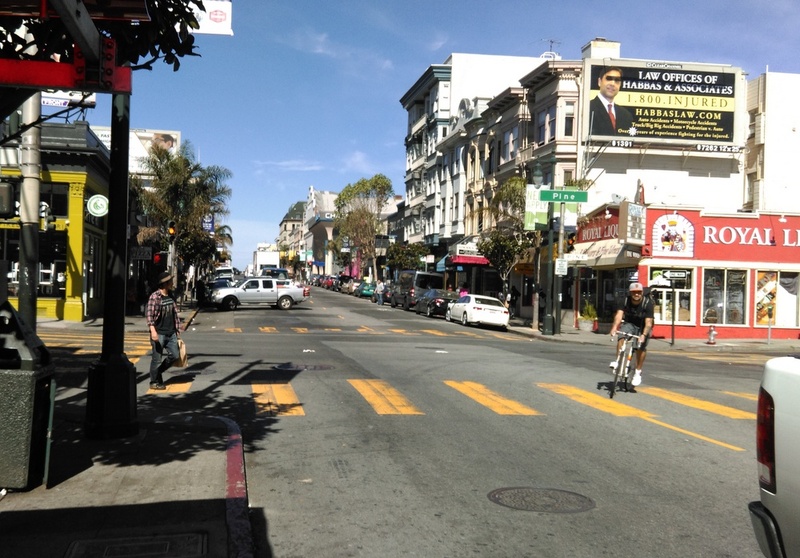 The SFMTA has nixed a block of protected bike lane planned on Polk Street, where merchants including Mayor Ed Lee’s optometrist have vocally opposed it to preserve car parking. The raised, protected bike lane between California and Pine Streets was removed from Polk’s plans six months after they were presented at the final public open house. SFMTA Director Ed Reiskin ordered the reduction, as shown in emails [PDF] obtained by Madeleine Savit, who founded Folks for Polk to advocate for a safer street. Reiskin and the SFMTA Board of Directors are mayoral appointees. 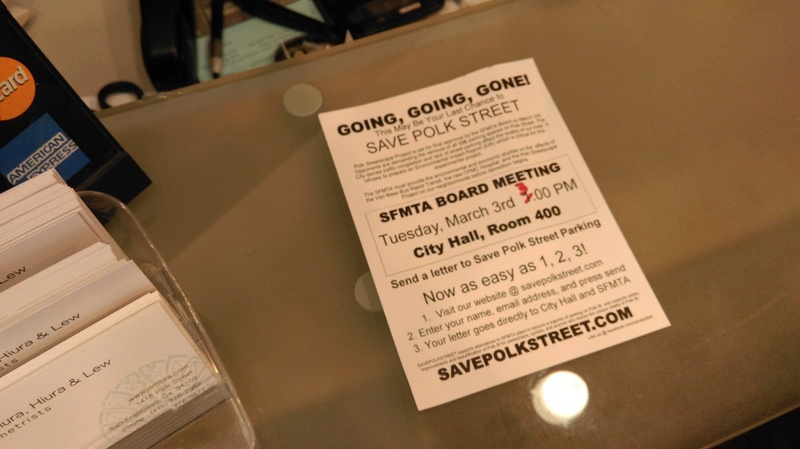 The Polk redesign, which is up for a vote by the SFMTA Board of Directors on Tuesday, has been fiercely opposed by a group of merchants called “Save Polk Street,” which has spread misinformation in its campaign to preserve parking. Under the proposed plan, partial bike lanes would be installed by removing about 30 percent of the 320 parking spaces on Polk, or 8 percent of parking spaces within a block of the street. About 85 percent of people on Polk arrive without a car. Drs. Hiura and Hiura Optometrists, which posted a photo on its Yelp page of Mayor Lee in “his new frames,” had a “Save Polk Street” flyer on its reception desk when Streetsblog visited the business today. Dr. Ronald Hiura told Streetsblog that he has “talked to the mayor and SFMTA Board members personally,” which “could possibly” have driven the removal of the bike lane on his block. “I was happy to see that they have revised that one-block issue,” he said. Construction on the project has already been delayed by a year, and the original plans for protected bike lanes on Polk were dropped for at least 10 of 20 blocks. Under the plan presented last March, which wasn’t expected to change significantly, Polk would only get a protected bike lane on the northbound side between McAllister and California Streets, with a buffered, painted bike lane on the other side. 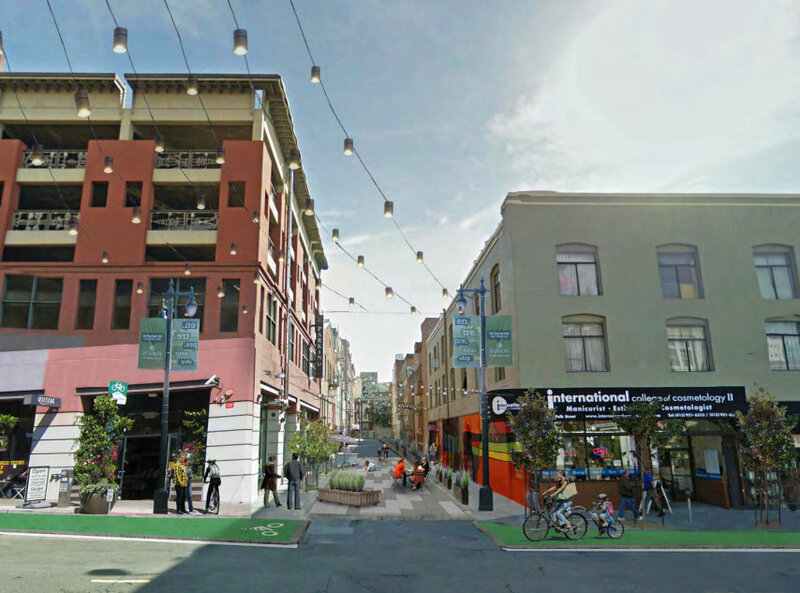 On the northern stretch, between California Street and Broadway, the southbound direction will have a painted bike lane running between parked cars and moving cars. Northbound will have a part-time bike lane, with parking banned along the curb during morning rush hours. During other times, the only provision for cycling northbound will be green-backed sharrows in the traffic lane. With the latest revision, the unprotected stretch will be extended another block south to Pine. 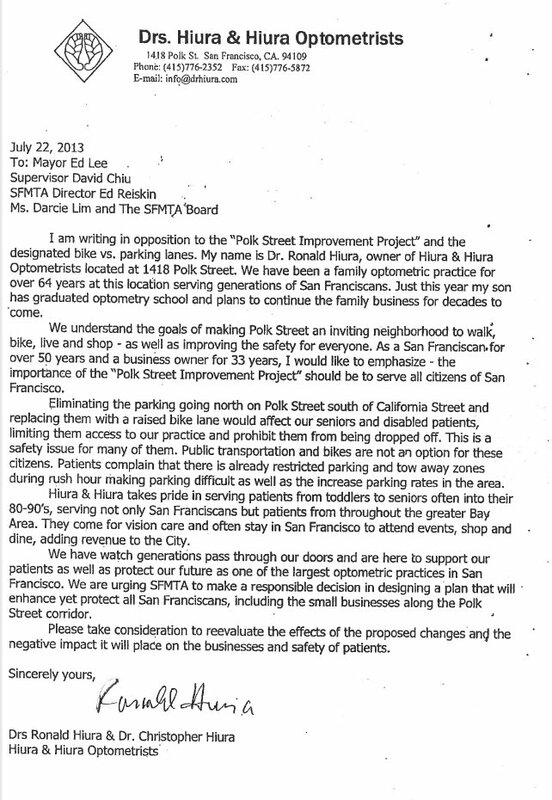 SFMTA Director Reiskin told Streetsblog, “Having heard some pretty strong concerns about the proposal for that block, we thought it best to change it.” He noted that the SFMTA had received opposition letters from merchants on that block in 2013, one of them from Hiura Optometrists. The most significant new information to come out recently was new crash data showing that Polk is even more dangerous than previously thought. According to police data, there were at least 149 bicycle-related crashes between November 2006 and December 2014, or about 1.5 per month. Since November 2011, there were 56 such crashes — seven of them at Pine, more than any other intersection on the corridor. Overall, about 75 percent of bike and pedestrian crashes on Polk occur between McAllister and Pine. In 2013, Streetsblog happened upon the aftermath of a bike crash at Polk and Pine while filming a video. A man who worked at Royal Liquors, which sits on the adjacent corner and has signed an opposition letter to the SFMTA, told us we could not film the street, attempted to block our camera, and told us to delete our footage. He repeatedly insisted that the bicycle rider was at fault, although the driver who hit him apparently veered into the oncoming traffic lane and fled the scene. Hiura, the mayor’s optometrist, said he wants to keep parking in front of his business available for elderly patients who drive, and that the bike lanes won’t make the street safer or increase ridership. Hiura said he felt endangered by the bike traffic when he visited Copenhagen, Denmark, where a broad range of residents — including the elderly — get around on raised bike lanes and traffic-calmed streets that criss-cross the city. With an urban population of over 1,200,000, Copenhagen’s overall traffic deaths are on a trend of decline, with about 10 to 15 per year [PDF] (compared to SF’s 28 last year, and 34 in 2013). Thirty-six percent of trips in Copenhagen were made by bike as of 2012. In New York City, three years after protected bike lanes were implemented on six street segments, the city found that total traffic injuries dropped 20 percent and pedestrian injuries dropped 22 percent. On Broadway, bike volumes jumped 108 percent while bike crashes with injuries fell 18 percent. In SF, surveys done on commercial streets in walkable neighborhoods, including Polk, have consistently found that merchants vastly overestimate how many of their customers drive, and that those who do drive spend the least. A city survey released a year ago also found that out of 140 respondents who use Polk, 48 said “the biggest challenge affecting Middle Polk” was the “unsafe environment for pedestrians and cyclists.” It was the top choice, while “not enough parking” was chosen by 16 respondents, making it the third-most selected choice. If Mayor Lee did put pressure on the SFMTA to remove a bike lane for his optometrist, it wouldn’t be the first time he’s used his leverage to undo a smart decision at the agency in the name of parking. Last year, he got the SFMTA Board to repeal Sunday parking meters. SFMTA Board member Cheryl Brinkman said she hopes the board will demand a bolder, safer plan for Polk on Tuesday. Mr. Lee should have an open and public debate with himself. Thank you all for those who took to calling him out on Twitter and Yelp! As of Saturday, the optometrist took down the Save Polk Street flyers from his storefront. He may still have them on his desk. Also, in a possible effort to hide his Yelp page from people who would otherwise see the four one-star reviews he got, he also removed his “People Love Us on Yelp” sticker from his storefront. For those unaware, before this debacle, he posted misleading flyers on his block about the SFMTA wanting to build a bike freeway, and started a petition opposed to this idea that gathered 300 signatures. In other words, he has a history of opposing this. As an aside, protected bike lanes may be ‘new and unconventional’ to SF – but even as close as Seattle, we’re literally cranking a new one out every few months. My feeling has been that the grassroots latched onto this Vision Zero idea and pushed it up the tree. Unless I missed something that actually looked like real embracing of it? i mean sure, let’s put the slogan on a banner and have a press conference, now that you’ve made all this noise about it and made me uncomfortable and there’s no way I can say I’m against it, either. There’s a difference between smiling for photos while you hold that stick up against my hand vs. taking the baton and running with it. If 85% of cyclists did that, they’d have to change the one-way street, eh? I recall listening to a merchant on 3rd in Dogpatch who was mad at the MTA because he couldn’t reserve the parking space in front of his business for his car. I really wish I could be there in person but as I work during those hours I cannot. Thanks to all of you who are able to make it out in person to show your support–and if, not, please send an email to the above people! I’ve been home sick from work, so I watched the MTA board meeting from Seattle (where we’ve already built 15 protected bike lanes, mostly in 24 months). This was a depressing and fascinating counter-case study in why San Francisco can’t get anything done. So the compromise was to build the wrong street, and maybe rip up all that concrete you just installed in after seeing how many people get preventably killed and maimed for lack of vision? Stripping away nice verbiage, Gwyneth was a face-palm embarrassment worthy of Jon Stewart treatment. I don’t think she made a single sentence that wasn’t riddled with factual errors (e.g. assertions directly counter to extensive peer-reviewed transportation research), empty platitudes, and other vacuity. YOU CAN’T COMPROMISE BETWEEN BUILDING THE RIGHT PROJECT OR THE WRONG PROJECT. YOU SIMPLY DO THE RIGHT PROJECT. Your peer cities have already moved to the JSK strategy of taking the best desired plan, implementing it on a tactical urbanism basis where it’s cheap to rip out if it doesn’t work, and making decisions based on data rather than fears. Anyway, we’re building a several more cycle tracks up here this year. Feel free to come up if you want to see how things get done — don’t miss Pt. Grey Road in Vancouver BC. The reason Ed Lee sounds like he contradicts himself is simple. Everything he does has money as the priority. Even the reason Ed Lee promotes cycling has money at the root. He realizes that one of the best ways to increase support of increasing the housing to attract more wealth to this city without worsening the traffic & parking problems is to persuade more of the population to use bicycles for transportation. I am genuinely curious, do you actually believe what you just posted? Having a parking spot for the general public that is always full in no way helps a disabled person. If Dr. Hiura was genuinely interested in a disabled limited vision person, he would have the spots in front of his business turned into blue handicapped or white loading zones. How much do you want to bet he and his staff park there and feed the meter? Disabled people have taxpayer financed shuttles that will take them door to door and if they have to drive, they are most likely to end up in the garage a block away since parking spots on Polk are almost always full. This has nothing to do with helping the disabled or their patients and everything to do with his selfish me-first agenda. Single business owners should not be making public works decisions, that’s absurd and frankly not up to them. Oh unless the mayor is a client and does what you say. Agreed. It’s appalling, a huge disconnect in a city that prides itself on innovation and compassion. Progressivism seems to have been relegated to issues of personal style while politically we’re so used to grasping low-hanging fruit that we’ve forgotten how to reach higher. It shouldn’t be this hard. There’s still a lot of deciding to do. Stay in the conversation. so you’re encouraging negative yelp reviews on the dr. because he disagrees with your position? that’s cowardly…. Really?? Save for Polk street – ed lee has done more for cyclist’s then all other mayor’s combined – by orders of magnitude. The fact that the Bike Coalition didn’t get it’s way and a compromised was reached is the way life works. The bike coalition, correct me if I am wrong, has gotten everything else it asked for during Ed Lee’s administration. What I am reading in the comment section, that all the sudden the optometrist has bad reviews etc really reinforces the point that cyclist need to grow up. SF is a very congested place and nobody is going to get a 100% of what they ask for period. The merchants along Polk know their business and their customers far better than street bloggers or SF Bike Coalition – and you should respect that fact. I didn’t say he hasn’t. Yes, he has done a lot to promote cycling here in SF, which is great, but his choice to consider parking for businesses over safety to save lives is just one of the things that is making it obvious that he values money over the lives of people whom he doesn’t know personally. However, I’m sure if a loved one of his ever gets killed by a motorist, he’d place life above money. His loyalty lies where there’s money. To a person like him, money is more valuable than (strangers’ ) lives. Wow – I don’t understand how you can say that?? 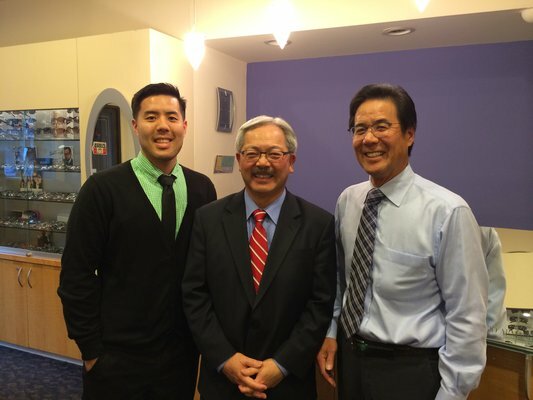 I am the furthest thing from and ED Lee fan, this is the one time that he’s compromised…. all other times, all the dedicated bike lanes, bulb out and the other projects that have meant a net loss of 5,000 parking spaces in SF .. add to that another 5,000 meters – most of which were no where near biz districts (turk and gough). Nearly all of those in the name of safety. Unlike the compromise agreed to on polk, the doubling of parking ticket and increase both meter rates and the number of meters were only to raise more $$. I have lived in SF for 25 years and there has been far more progess, at the expense of drivers than in whole other 20 years combined. if you care to look at the other side of the coin – for drivers, both parking meters and tickets have double under ed lee in just the last 5 years. The loss of other parking as mentioned above… in the name of biker safety. He compromises on one issue and suddenly he values business more than life…. honestly, get real. If the Biking community were really that interested in Safety they would do a great deal more to promote safe cycling, sharing the road, and mandatory helmets… none of which I see advocated here or with the bike coalition….. Scrap the Mandatory Helmet Law! helmet law and focus on measures that will protect people who ride bicycles. petition today to oppose this bill. It’s ridiculous of both you & Ed Lee to want bicycling safety to be secondary or thirdly behind parking for motor vehicles. Parking is a convenience, bicycle SAFETY is about saving lives! LIVES! Pushing a bicycle helmet law doesn’t address the problem of collisions between motor vehicles & cyclists. Bicycle helmets are made of materials that only protect skulls from falls; they don’t survive the impact of a car or the weight of getting run over. Pedestrian safety is even more of an issue since the rates of pedestrians getting injured & killed by motorists is much higher than that of cyclists getting injured & killed by motorists. The rates of motor vehicle collisions with other motor vehicles is way significantly higher than all collisions. Those rates make the source of the problem obvious–that it’s the reckless driving by motorists that’s the cause of so many accidents involving motor vehicles. Helmets on cyclists won’t solve the problem. Even helmets on pedestrians & motorists won’t solve the problem. man- you’re not rational, but you seem to want to change the topic? Bottom line. Cyclist (of which I am one…I have 3 bikes that I ride a lot both around sf, marin, etc). Drivers have lost at every turn in this city for more dedicated cycling lanes, bulb outs (which I think are not the best way to do things but…), the city is heavily promoting cyclist – at a cost of over 5,000 parking spaces erc etc. Bottom line – if nothing Ed Lee has done is enough or even close, despite doing orders of magnitude more than any other administration for cyclists – than you can kiss more victories good bye. You should also understand that the streets are a shared resource – you clearly feel they should not be. (how did your bike and belongings get to SF in the first place? Did they walk here?). Further, if feel safety is the most important thing than you should back the helmet law. It’s only common sense. As a cyclist I wouldn’t dream of throwing a leg over any of my bikes unless without a helmet and gloves. Period. Damned by faint praise. There was zero impetus to do anything for cycling until the Willie Brown era, he was openly hostile to cyclists. Gavin Newsom oversaw the creation of the bike plan but couldn’t do anything about it because of the injunction. Lee wins by default. And there are plenty of areas where Lee has failed. Even projects that have been built have been subject to an abysmal record when it comes to timeliness. Lanes did eventually go in on Chavez, but the setup at Evans’ street is crap compared to the original plan. As a cyclist I wouldn’t dream of throwing a leg over any of my bikes unless without a helmet and gloves. Period. Are helmets banned? The law will allow helmets? obviously not… but the California bike coalition is not endorsing the law… quite the opposite really…. Sources?? sorry that’s not real creditable now is it?? The plan for Cesar Chavez was deeply flawed (the plan to slow traffic) and I think we’re discussing polk street here? ghts have been sycnchronized at 13mph,, for cyclist, this slows traffic. It’s not going to happen on every street, as when I drive (very rare in the city) it’s PIA to stop literally every block. However, the changes are happening far more rapidly now than in decades past. .
As a group, I have to say you’re the most ‘glass half empty’ crowd that I have encountered. Faint praise? Um… they just can’t possiably do enough for you folks can they? at any cost. It’s a tough balancing act. For the record, there was not nearly the movement under brown or Newsom as there is now. Cyclist understood in years past, that street were shared spaces. It seems now that you won’t be happy until San Francisco is an amish community I don’t think that’s going to happen… but good luck. Lights? There is only one light on the entire length of Cesar Chavez I referenced. Or did you just ignore my example and go off bloviating on some other street? “I think we’re discussing Polk Street here” – you are the person who said every other time the cyclists got what they wanted. You’re the one who changed the topic first by bringing up the non-issue of the proposed helmet law which I responded to in return. Don’t change the topic (i.e. don’t toss more smoke screens) and I won’t respond to the changed topic either. It’s as simple as that. Oh so you’d didn’t write this?? I am done here…. >>Helmets on cyclists won’t solve the problem. You miss the point… only spoiled, small minded folks expect to get everything out of every Negotiation which was the larger point…. but clearly your don’t realize this. I am well aware of SFMTA Plan to increase congestion and slow traffic on CC…bad plan. Period. Yes, I TYPED that, but that was a reply to your off-topic post about the Bicycle Coalition’s position on the proposed bicycle helmet law. I think the best way to give Hiura Optometrists feedback is through a Yelp review. People should know this business puts their interests ahead of pedestrians and cyclists. Hiura Optometrists is my eye doctor. I’ll let them know I’m going to stop walking or biking to their shop, if their not supportive of safer streets for the elderly and everyone else.